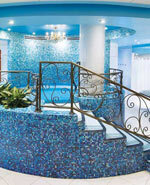 Elmwood Spa | Spa Inc. Inside a historic building located in the heart of Toronto lives Elmwood Spa, an urban spa built upon traditional healing rituals and a rich, local history. Although the spa incorporates elements from several different cultures, it is truly a love letter to Thailand. The spa has won WestJet Magazine’s Value Award several times and was named one of Spafinder’s Top 10 Favourite Day Spas in 2010. Spa treatments are not all Elmwood is known for; its cuisine is also a big draw for clients. Bangkok Garden, the Thai restaurant situated on the spa’s main floor, has also won a number of awards, including the Thai Consulate’s Thai Select Premium Designation award in 2015 and AAA’s Diamond Award. Elmwood Spa and Bangkok Garden are both owned by Canadian entrepreneur Sherry Brydson. The Elmwood building was designed by Gordon & Helliwell Architects and built in 1889 by Edward James Lennex, the same architects who built Casa Loma and Old City Hall. In the 1950s, it was known as the Elmwood Women’s Hotel, a boarding house where women would reside as they learned a trade in the city. After the boarding house closed, the building was abandoned, fell into disrepair, and was later condemned. By the time Brydson, who founded Elmwood Spa, purchased the property in 1979, the space was occupied by the Elmwood Women’s Club. The club included a small spa called Spa at the Elmwood. After Brydson bought the club, the spa slowly began to grow. Now, Elmwood Spa takes up all five floors of the building. “Over the years, our guests have become familiar with the landmark itself, and have also come to appreciate our desire to deliver a unique experience,” says Marie Picton, Elmwood’s Executive Manager. It is no secret that Elmwood Spa is heavily influenced by Thailand, where Brydson lived for a number of years. “I have to give credit to her for our LI’TYA services that we offer here today [and] also for the Thai influences throughout the spa,” Picton says. Brydson’s role in the integration of Thai culture drove Elmwood to invite Thai monks to bless its spa in 2007. “Their visit [and] their cleansing of the space allowed us to do what we do best.” In 2001, Brydson and a group from Elmwood Spa visited Thailand, where they found the inspiration for the spa’s signature Siam Herbal Body Treatment and Deep Siam Massage services, which uses Thai herbs in compresses to relieve tension and to revitalize the skin. 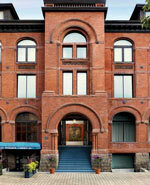 Outside of its cultural influences and history, Elmwood Spa has a strong sense of community. The spa is dedicated to providing exceptional quality to its guests at a reasonable cost, so that price will not be a barrier. This led the spa to develop its own skin care line, as well as maintain ties with other spa brands. The spa is also home to many community-minded staff members. Elmwood has its own glee club, called inSPAration, founded by one of the spa’s staff members, which has raised money for the YWCA. “I like to think that we are a family here,” Picton says. Elmwood’s multi-dimensional approach, backed by culture, community, and attention to detail, is what allows it to accomplish its goal of creating a warm, reinvigorating experience.